For the past 65 million years, mammals have been the planet’s paramount terrestrial animals and, with the exception of insects and arachnids (spiders), have the widest worldwide distribution. Every terrestrial and aquatic biome is inhabited by mammals, and their ecological success has been largely attributed to the ability to control body temperature. The 5,500–5,700 mammalian species range in size from the bumblebee bat (1.2–1.6 inches or 30–40 millimeters) to the largest living animal, the blue whale (greater than 100 feet or 30 meters). The first true mammals made their appearance some 200 million years ago and, over the course of tens of millions of years, diverged into three branches: The monotremes are egg-laying mammals, such as the duckbilled platypus, found only in Australia and New Guinea. Kangaroos and opossums are marsupials, found in Australia and the Americas, in which the newborn continue to develop outside the womb in a marsupium (pouch). Ninety percent of all mammals are placental (eutherians), in which the fetus is carried in the womb until birth at which time it is at an advanced stage of development. In 2013, a shrew-size Chinese fossil was found, named Juramaia sinensis, which, at 160 million years, is thought to be the oldest placental mammal. Humans are placental mammals classified as primates. Mammals have a number of unique characteristics not shared by other vertebrates: Mammary glands are modified sweat glands that allow females to nourish their young with milk, the offspring’s primary source of nutrition. (In 1758, Linnaeus named these animals mammals, from the Latin = “breast.”) Hair or fur, present at some time during life, protects mammals against extreme cold. The middle ear contains three bones that transmit sound vibrations into nerve impulses. The lower mammalian jaw consists of only a single bone on each side. Other characteristics, although not necessarily unique to mammals, include being warm-blooded (endothermic) and having specialized or differentiated teeth, a larger brain (in particular, the neocortex, the most advanced brain area), a diaphragm (a muscular sheet that separates the heart and lungs from the abdominal cavity), and an efficient four-chambered heart. SEE ALSO: Primates (c. 65 Million BCE), Placenta (1651), Paleontology (1796). 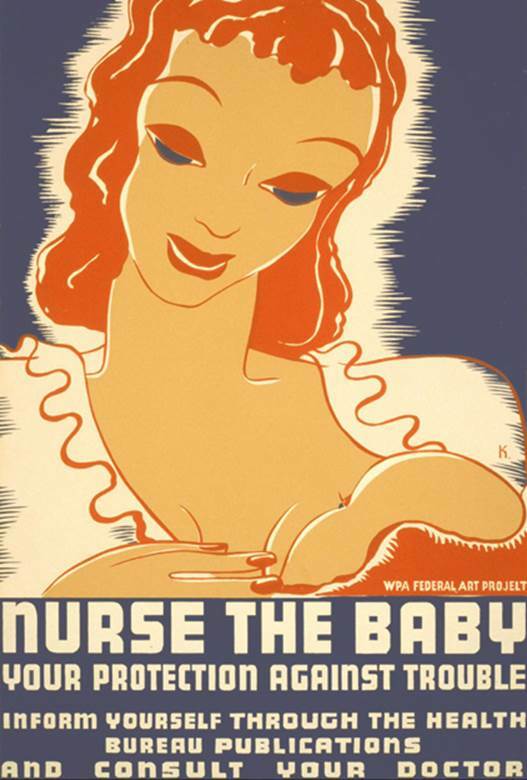 This 1937 poster promoted infant nursing. Breastfeeding was common since ancient times, but declined significantly from 1900 to 1960 because of negative social attitudes and the increased popularity of infant formulas. Since then, the practice has increased, and experts recommend it for at least the first six months of infant life.